Chilly enough for a Warm Winter Giveaway! 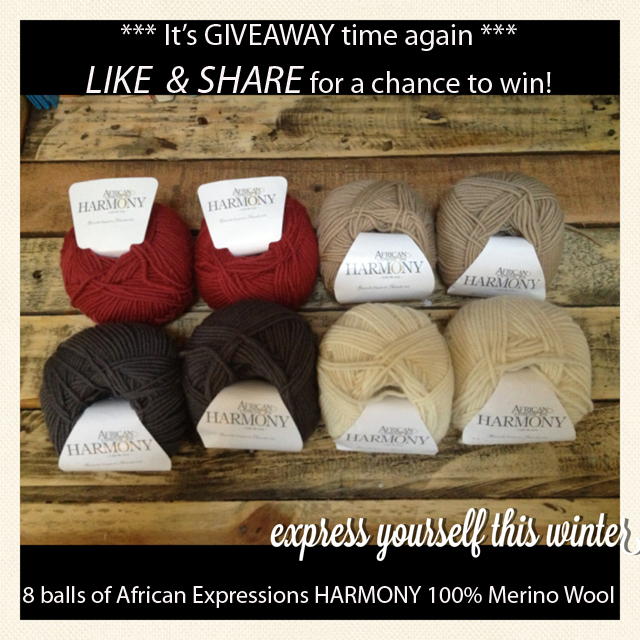 Please LIKE Woolhogs on FB and then LIKE & SHARE this pic to be in with a chance of winning this warm little winter stash of 8 x balls African Expression HARMONY 100% Merino wool in Beige, Cream, Charcoal & Deep Red! * if you are not a Facebook user, please REBLOGG this post – if you want to reblogg is anyway, GO WILD!!! Woo liked and shared! Great giveaway! If you’ve got some mental space left for another giveaway apart from the Holla Knits blog tour: Woolhog is giving away 8 balls of merino yarn in 4 delightful colors that just beg to be worked into a colorwork project for next winter! Just head over and like&share them on facebook (link provided). Here in north-central Alberta, we’re now one month into spring. Glancing from the calendar to the slow-melting scene outside will immediately confirm that our weather is falling way behind schedule. Yesterday was gorgeous at +8ºC, so I did knit out there in direct sun for a bit… And so, this is still not enough to melt my summer knitting hopes… But what is a wanna-be-knitting-outside knitter to do?!? The September Made It challenge – WINNERS! The September Made It – Winners to be announced soon! The Septmeber Made It – VOTING IS OPEN!